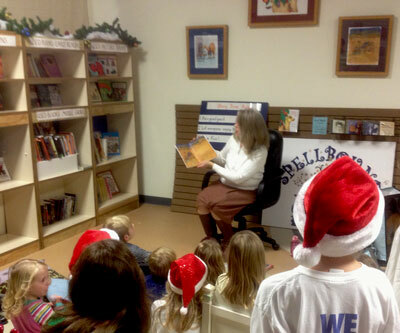 Leslie, owner of Spellbound Children’s Book Shop, reading Hababy’s Christmas Eve during a holiday story time. Original artwork is on display on the wall behind her. Hababy’s Christmas Eve was one of the books included in the Holiday Story Time at Spellbound Children’s Book Shop during the Woodfin Holiday Stroll in early December. 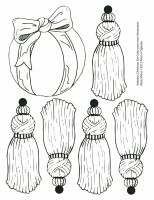 For that event I created two coloring activity pages, a color-your-own Christmas card and color-your-own ornaments page based upon illustrations from the book. These are sized for standard letter paper (8.5 x 1 inches). I recommend printing onto a card stock or heavy weight paper. For best results print pdf at full size, not “scale to fit” page. Color and cut out ornaments. Use a hole punch to add holes to top of ornaments and loops of ribbon or yarn to make hanging on your tree easy. Cut card page in half horizontally for two Christmas cards. Fold each in half for a card that will fit in a standard A-2 envelope.